Welcome to the Waterwynch website. We have tried to cover all aspects of the business on the website so the area that interests you will have its own link. Just click on the relevant box above. When we originally saw the 'For Sale' sign leading to what was some derelict farm buildings we were already pondering on moving to the countryside. 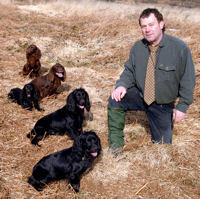 Dai had been training and running gundogs in competition for twenty-five years and was looking for somewhere suitable to keep and train the dogs. The Buildings which were originally a mill and (as we have been led to believe) have not been occupied by humans since the 1860's. We are beginning to research the origins of the buildings and when we find out more we will be updating this page. 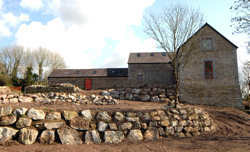 Since the 1950's the buildings had been used to house cattle and sheep in the main mill and for milking in the outer buildings. We have since renovated the buildings to become our home and renovated the outbuildings to guest accommodation, leisure facilities and kennels. We bought a reasonable amount of land with the buildings and purchased more as time progressed. The land is mostly rough and we aim to conserve the habitat, wildlife, flora and fauna. The buildings were, when we bought them known as Fronhaul farm buildings so we obviously wanted to rename our home. We decided upon Waterwynch as it was the name of Dai's favourite haunt as a child 'Waterwynch Cove'. It is a name that suites the house as it had a stream that turned the wheel that milled the corn and wynches that would have been used to lift the corn in and out of this very tall building. The gundogs who were originally kenneled at the Rowston Holiday Park and are now kenneled at Waterwynch settled into their new home and enjoyed the fact that they were given more attention. 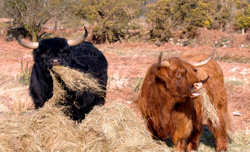 As time progressed we decided to purchase some animals to keep the land grazed and decided upon Highland Cattle (read more on the relevant page) and Shetland sheep for their hardiness and the fact that they will eat almost any land covering including Nardiss Grass, Millenia Grass and Heather. On discovering some very interesting looking stones on the land we are in the process of discovering how they have come about. We have used a lot of the stone for our own use and think that other people would benefit from it too.